People often enquire about who can benefit from Music Therapy, and the simplest answer is EVERYONE! Music Therapy can positively affect any person’s body and mind, as well as alter their feelings. Music is a universal language that transcends age, ethnicity, personal history and ability. As a result, Music Therapy can positively impact upon the lives of everyone, promoting well-being and improving the quality of life in those who need it. At MTCNI, we work with a wide range of people with varying conditions. Our belief is that Music Therapy interventions can benefit anybody and there is no need for clients to have any form of musical experience or training. 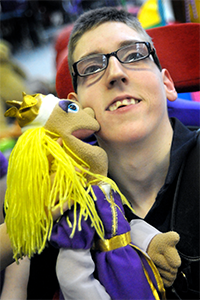 Our approach is to make it as accessible as possible for anyone to benefit from our support. We work with people from varying age groups (from young children to older adults), people of all abilities & within in a variety of settings (including schools, community groups and health centres). 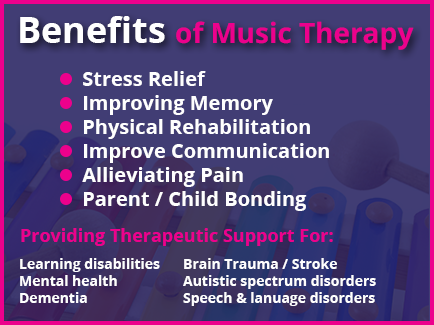 Please feel free to get in touch if we can help you, someone you know or simply want to know more about the benefits of Music Therapy.